March 6, 2016 would have been the 99th birthday of cartoonist and writer Will Eisner (1917-2005), and once again the week surrounding it has been declared Will Eisner Week by the Eisner Family Foundation. 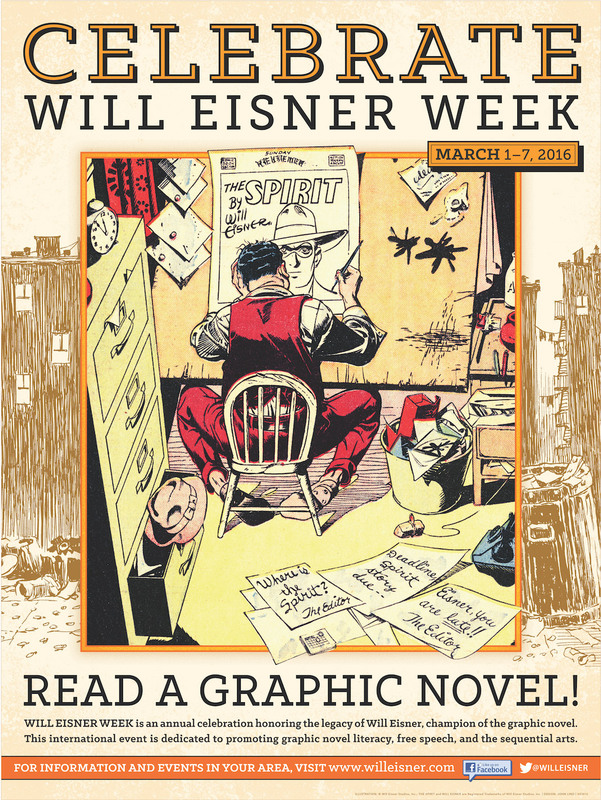 Will Eisner Week is an annual celebration promoting graphic novels, literacy, free speech awareness, and the legacy of Eisner. In 1938, the popularity of characters like Superman proved to magazine publishers that comic books with original content could turn a profit, and a young Will Eisner partnered with cartoonist Jerry Iger to create one of the first comic artist studios. Eisner & Iger employed and trained many young artists who later became widely-recognized in the comics publishing industry, including Bob Kane (creator of Batman) and Jack Kirby. This “Spirit” mystery story from 1947 opens with the death of a cartoonist. From 01/MSS 1980-09, Box 299. Eisner wrote and spoke passionately and articulately on the narrative language of comics. His monographs Comics and Sequential Art and Graphic Storytelling and Visual Narrative are considered seminal works in the field of comic studies. 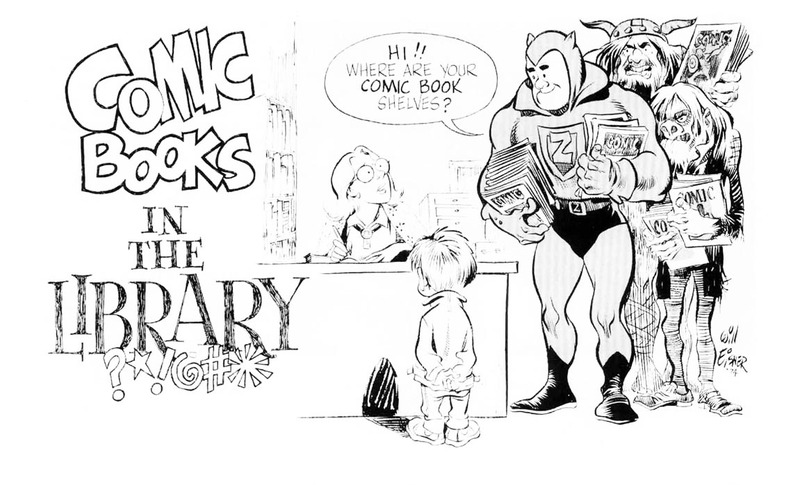 He often gave interviews and lectures on the subject of comics art, and in 1974 wrote an article for the School Library Journal encouraging libraries to collect comic books (a practice now common in public and academic libraries). His scholarly writing popularized the term “graphic novel,” now the standard description of long-form works in the comics medium. Eisner helped shape a new generation of comic artists as a teacher at the School of Visual Arts in New York, and his creative work continues to inspire artists and scholars long after his death. We invite you to take a moment between March 1st and 7th this year to appreciate the legacy of this master artist, teacher, and advocate, through comic books available in Special Collections & Archives in the Robert M. Ervin Jr. Collection, or in works by and about Eisner throughout FSU Libraries. Eisner, Will. (2008). Comics and Sequential Art. New York : W.W. Norton. Eisner, Will. (1974). Comic books in the library. School Library Journal, 21(2), p. 75-79. Eisner, Will. (2008). Graphic Storytelling and Visual Narrative. New York : W.W. Norton. Robert M. Ervin, Jr. Collection, Special Collections & Archives, Florida State University Libraries, Tallahassee, Florida. Inge, M. Thomas. (Ed.). (2011). 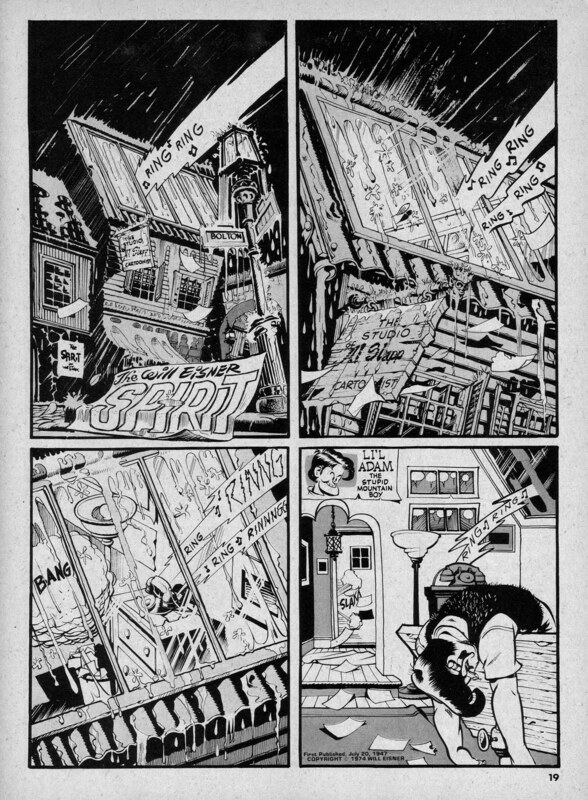 Will Eisner : Conversations. Jackson : University Press of Mississippi.